Grants, loans, scholarships and employment-related tuition awards available for the purpose of aiding eligible students who need assistance with financing their education. Applicants must first be admitted in order to apply for financial aid from private sources. If education funds in excess of tuition and fees are received, the student will receive a refund in the form of a check or direct deposit. ENI offers various private scholarships from private donors and groups (local, community service and organizations) who believe in our Founding Principle to make nursing education accessible to all qualified persons wanting to embark upon a rewarding journey of service to others. Florence Nightingale Fellows—awards up to $9,000 for Standard Program (full-time) students only that demonstrates dedication to the field of Nursing and a desire to make a true difference in the world health community. Ademaro Scholarly Excellence—awards up to $15,000 for Standard Program (full-time) students only that demonstrate academic excellence, a well-rounded appreciation for scholarship, and a commitment to life-long learning. Workforce Investment Initiative—awards up to$4,500 for Bridge Program (part-time) students only who are displaced and/or unemployed professionals needing to re-jumpstart their medical career. Students may apply for no interest student loans to cover up to 50% of program tuition and fees. 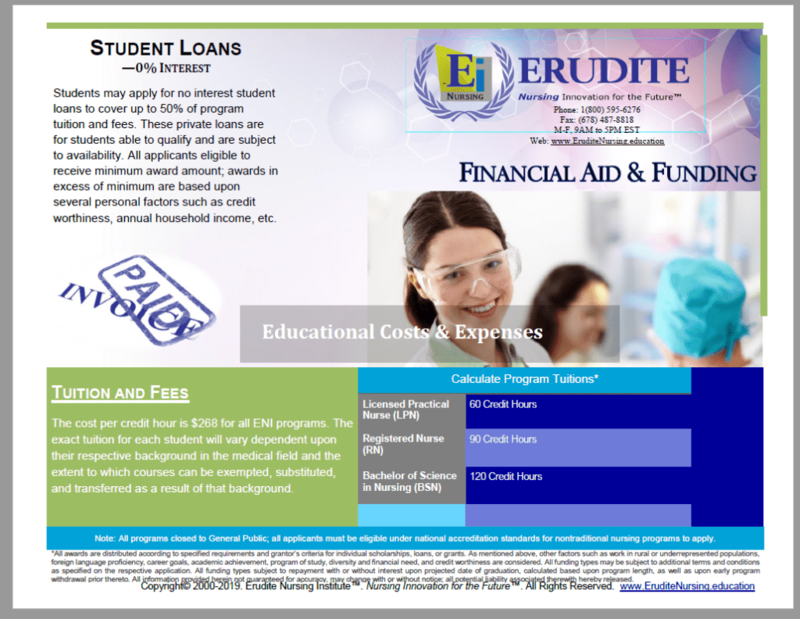 These private loans are for students able to qualify and are subject to availability. Repayment begins immediately following the projected date of graduation, based upon program lengths indicated in General Program Information concerning program lengths. Programs are not federally funded. *For households with more than eight people, add $6,240 per additional person. Always check with the appropriate Financial representative to ensure the most accurate guidelines. *All awards are distributed based according to specified grant requirements and donors’ criteria for individual scholarships. As mentioned above, other factors such as work in rural or underrepresented populations, foreign language proficiency, career goals, academic achievement, program of study, diversity and financial need are considered. Irrespective of qualification for funding based upon income ranges indicating need, financial aid and other funding neither required nor guaranteed and is offered subject to availability.